An international team of scientists has described a rare fossil site that is believed to be among the earliest evidence of different fish species using a common nursery -- much like ones utilized by some fish today. 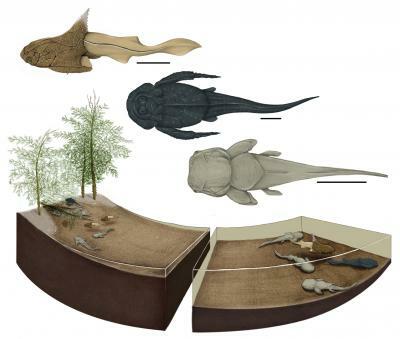 A quarry in Strud, Belgium, that was excavated between 2004 and 2015 yielded fossils of multiple species of placoderms, which are extinct, armored fish that represent some of the earliest jawed vertebrates on Earth. Dating back to the Devonian period, an era predating the dinosaurs by hundreds of millions of years, the site yielded smaller-sized fossils that show immature placoderms occupied the area. At the same time, larger placoderm fossils, indicating mature fish, were not found. "These sorts of juvenile-only assemblages are rare in the fossil record," said Ted Daeschler, PhD, vice president of the Academy of Natural Sciences of Drexel University, who served as a co-author on the study published in PLOS ONE. "We are quite sure that the juvenile-only placoderm assemblage is not the result of sorting of small material by water currents because there are larger skeletal elements of other kinds of fish. We believe this points to a nursery." "Reconstructing life histories of extinct organisms is a rare opportunity to go beyond simply describing the anatomy of ancient life," Olive said. "With these sorts of records, we can actually begin to understand aspects of behavior and life history of organisms that went extinct hundreds of millions of years ago." The Strud site, which dates to the late part of the Devonian period (more than 360 million years ago), features many pieces of immature fish skeletons that were largely intact despite being small and fragile. As such, this pointed toward slow-moving and shallow water. An environment like that would have been -- and remains, for present-day fish -- ideal for the development of the young. "Adult placoderms may have used the nursery of Strud only to lay eggs and/or give live birth, and would have generally lived away from the nursery in deeper waters," wrote the research team, which also included paleontologists Gaël Clément of the Museum national d'Histoire Naturelle in Paris, and Vincent Dupret, of Uppsala University in Sweden. An added benefit of the nursery site would have been its protection from predators, thanks to the "large, hard and sometimes spiny" vegetation that was found fossilized on-site. While the find at Strud is now one of the oldest-known nurseries in the world, similar records exist in Pennsylvania, especially at a site called Red Hill. During the Devonian period, the Pennsylvania and Strud sites would have been relatively close to each other since the Atlantic Ocean hadn't begun to open to separate them. Daeschler and Olive's work focused largely on comparing the Red Hill site to Strud, noting many similarities between the two and using the size and shape of placoderm fossils from Red Hill, housed at the Academy of Natural Sciences, to establish the relative maturity of samples found in Strud. With three different types of placoderm fossils discovered at Strud -- Grossilepis rikiki, Turrisaspis strudensis and Phyllolepis undulata -- it opens a question for scientists like Daeschler. "This is the first time that it can be demonstrated that several species seem to have used a common nursery," Daeschler said. "It makes us wonder: Has that always been a common reproductive strategy?" "In the case of placoderms like these, we're looking at some of the earliest jawed vertebrates," Olive said. "Understanding their life history can give us an idea of the primitive condition from which all other jawed vertebrates evolved." "By studying the past, with the ability to see a moment in time and changes through time, we are better able to understand ecosystems and the organisms that live in them today," Olive said. "Geologists say that the present is the key to understanding the past. But we can also say that the past is the key to understanding the future."